2. Sing I’m a Little Snowman to the tune of I’m a Little Teapot! And here is my hat (touch your head). I will melt away (shrivel down to the floor)! Now that you have the kids warmed up with winter music, how about bringing in our Frosty’s Birthday Party Program! 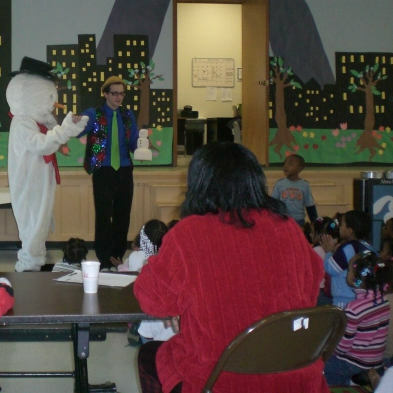 This comedy magic show is about Frosty the Snowman’s birthday and baking a cake for Frosty. At the end of the show, Frosty himself appears to meet and greet your kids. Here is more info on our Frosty’s Birthday Party Program. Note: Thanks to The Storytime Handbook by Nina Schatzkamer Miller for the music suggestions. I highly recommend this book for child care center theme ideas.